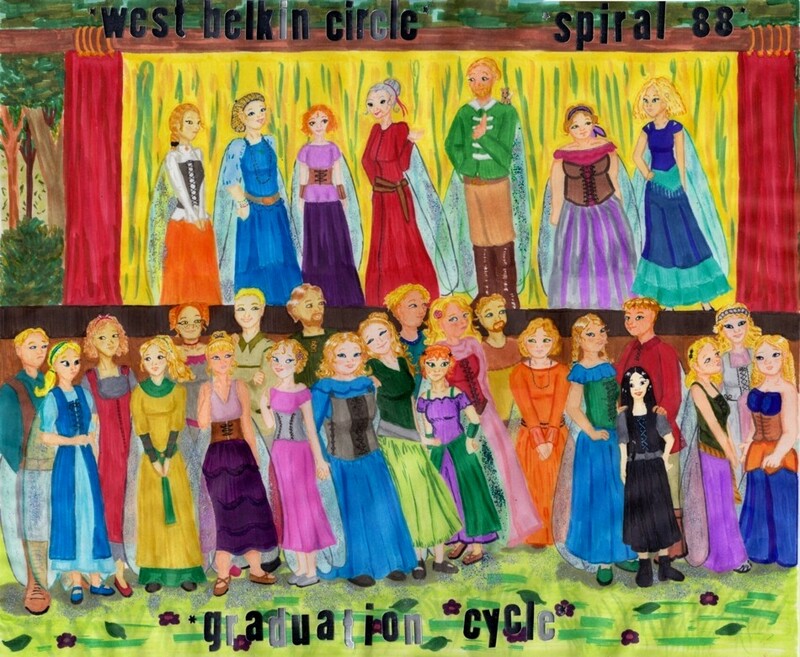 This is the graduating class of West Belkin Circle, Spiral 88: The "magick school" from my novel, where my protagonist Delia takes classes on how to be a successful fairy. Click on people to bring up detailed character head shots and their relevant story details. If you want to see the drawing larger, go here or click any part of the picture that's not a character. I put this together to help me figure out details of the minor characters and teachers who didn't get much face time in the story, mainly just as a writing exercise and a reference for myself. Spoilers for the novel will be encountered to some extent if you read all the details, because it reveals characters' majors and accomplishments and personal details as they are at the END of the book. If you want to know more about the fairies and how their book is doing, e-mail me.